Great swathes of Devon are National Park land; there is Exmoor National Park in the north of Devon and Dartmoor National Park in the south west of of Devon. Both national parks offer a wide expanse of heather clad wilderness where you can walk and commune with nature. Another attraction of the national parks are the wild ponies which breed and look after themselves. There are several parkland areas in England where wild ponies can be seen. Other areas are Bodmin Moor in Cornwall and the New Forest. Dartmoor is home to the Dartmoor pony although in common with other animals and plants it is threatened with extinction. Sheep also graze the land. It's a wonderful area for bird watchers and anyone interested in nature. 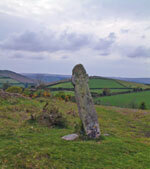 The hilly landscape is dotted with old tombs, granite outcrops and standing stones that invite curiosity. The ruins of the medieval village of Hountor also attracts the curious. The village was excavated in the 1960s and shows the remains of several longhouses dating from the 14th century. Find a country cottage for your stay near Dartmoor. Towns and villages near Dartmoor: Ashburton, Belstone, Bovey Tracey, Buckfastleigh, Buckland, Chagford, Haytor, Holne, Lustleigh, Lydford, Manaton, Moretonhampstead, North Bovey, Okehampton, Ponsworthy, Postbridge, Poundsgate, Princetown, South Tawton, South Zeal, Sticklepath, Tavistock, Widecombe-in-the-Moor, Yelverton. Exmoor National Park hugging 267 sq. miles of the north coast of Devon is not a wilderness but managed countryside. 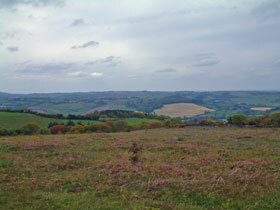 It's still scenic with areas or moorland where wildlife flourishes. Exmoor ponies also roam freely and you may be lucky enough to spot red deer. There are 31 native mammals and over 240 different species of birds. Much of the land is taken up by hill farming. There are five large rivers; spawning grounds for salmon and trout. One brilliant aspect of a holiday in Devon is that you can go walking in the national parks, enjoy a beach holiday for a few days, go sightseeing, pop into a couple of the numerous National Trust places of interest, visit gardens and do a host of other things. Devon offers such a great variety of activities on holiday. The national parks are eternally popular with walking groups or individual hikers so it's a friendly place if you meet fellow walkers. These wide open moorland places are perfect for dog walking. Dog owners face certain dog restrictions on Exmoor and Dartmoor. Walking your dog is permitted but owners are advised to keep their dog on a lead (no longer than 2 m) between the 1st of March and the 31st of July or when near livestock. Common sense really.